The relationship between money and macroeconomics is very strange. At one time money was thought to be central to the discipline - advanced courses in macroeconomics were often called monetary economics. We had monetarism. Then gradually money slowly faded away. We had real business cycle models that were just real, and if we wanted to make them nominal you just added money as a ‘medium of exchange’. Then even Keynesian models with sticky prices began to dispense with money altogether, becoming cashless. Money seemed both essential - for example to the concept of inflation and to why Says Law did not hold - but also dispensable. 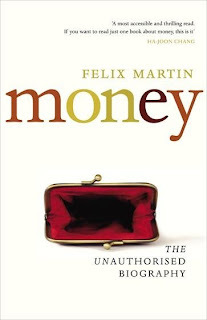 These thoughts followed from reading a book called ‘Money: The Unauthorised Biography’ by Felix Martin. 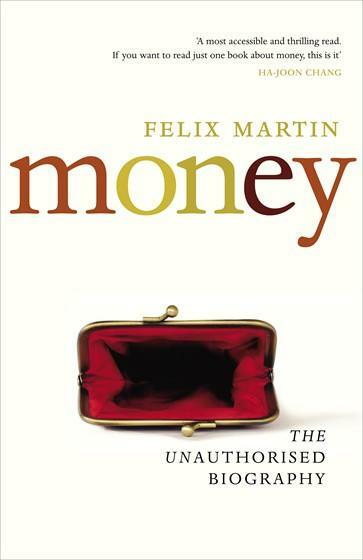 Some of this will be familiar, although what was new for me (but perhaps not to followers of Minsky or MMT) - and quite challenging - was the idea that this could all be traced back historically to a misconceived view of money itself. (According to Martin, the 17th century philosopher John Locke has a lot to answer for.) The threads developed from the historical account of the origins of money are numerous. For example money as credit is inevitably social, and so its value is bound to be politically determined. In a financial crisis, when the size of debts begin to encumber the economy, it is therefore quite logical and natural to adjust the value of money to redistribute between creditors and debtors. So this is a big ideas, big picture kind of book. Inevitably, therefore, some of the brushstrokes may be a little too broad or bold for some. The story of macroeconomics as essentially classical and real with only a brief incursion by Keynes is I think too simple and easy, and I would have liked to know his take on the explosion of macro work on financial frictions since the crisis. But the historical detail is fascinating, and the ideas they are used to illustrate are clear and thought provoking, so I’m very glad I read it. 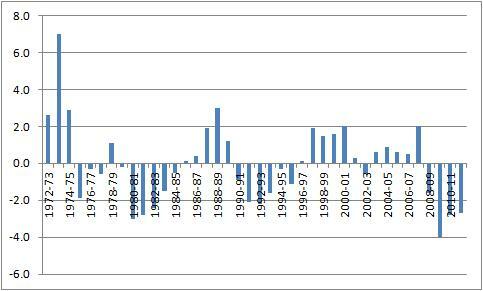 As you can see the big revision is in how much GDP fell in the recession. 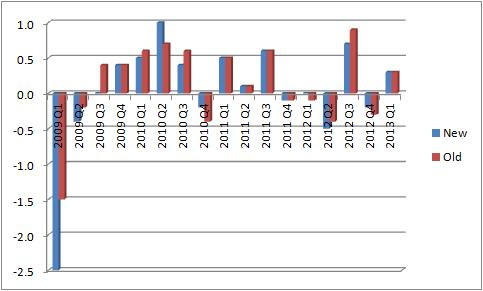 GDP is now thought to have decreased by a little over 5% in 2009 as a whole, compared to the previous estimate of -4%. At this point I cannot resist telling a small story about this number, but for those who are fed up with my personal anecdotes there is a serious point about inflation to follow. I make a weak attempt to connect the two at the end. At the beginning of 2009, I was asked to attend a breakfast meeting with the then Chancellor, Alistair Darling, along with some non-academic economists. I had never attended one of these before, so I did not know what to expect. I had not met Darling, but all the other economists invited appeared much more comfortable with the format and surroundings, so to be honest I was rather nervous. Academics in particular can appear out of touch because they do not have all the latest data at their fingertips. Sure enough, one of the first questions Darling asked was just how bad we each thought things could get. I cannot remember what each person said, but the general view was that GDP could fall by as much as 3% in 2009. I was the last to give my opinion. I could have ducked out, but instead I remembered one thing from my earlier days as a forecaster. This was that forecasts typically underestimate the extent of large swings in GDP, particularly if they are globally synchronised. So I said that I thought things could be worse than that, and GDP could fall by 5%. Impossible! was the immediate retort of one of the other economists: someone who is very well known and very sensible, although I will not say who it was here. This person then used their detailed knowledge of the data to say why it was inconceivable that GDP could fall by so much. One by one everyone else agreed that although things were bad, they could not get that bad, and 5% was an outlandish number. Just as I wished I had kept my mouth shut, or better still just not come, the senior economist from the Treasury who was there came to my defence: a fall that large could happen, and they described how it might happen. I of course take no pleasure in the fact that my forecast has been vindicated, and it was little more than luck, but it is one of those moments I will not forget. Now for something more consequential. 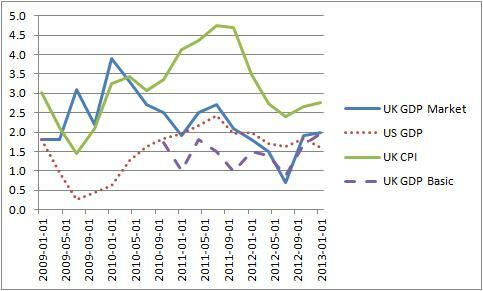 The chart below compares two different measures of UK inflation: the CPI (green) and the GDP deflator (blue). CPI inflation has been significantly above the 2% target since 2010. In contrast over the last year growth in the GDP deflator has been well below 2%. This is the deflator at market prices, so it includes indirect taxes. The dashed line is the GDP deflator at basic prices, which excludes these. The press release only includes numbers going back to 2010 for this series, but you can see that growth has been below 2% for the last three years. The dotted line is growth in the US GDP deflator - this moved in a more immediately understandable way after the recession, but over the last two years the UK and US measures have not been that different. The fact that output price inflation (which is what the GDP deflator measures) has been below CPI inflation is neither surprising, nor unique to the UK. What is less appreciated is that there is no reason from an economic point of view to focus on one series (the CPI) rather than the other (the GDP deflator) when setting monetary policy. At an intuitive level looking at the output price measure makes more sense, because policy has more control over things produced in the same country. At a deeper level, inflation matters because some prices are sticky, and the GDP deflator generally excludes volatile commodity prices. It should be less influenced by volatility in the exchange rate, so it may be better for that reason too. I cannot help but reflect on how different UK monetary policy might have been if it had focused on output prices rather than consumer prices. In 2011 interest rates were almost raised (3 out of 9 MPC members voted for doing so), despite the lack of a recovery. Would this have happened if the target inflation measure had been below 2%, as growth in GDP at basic prices was? Since then Quantitative Easing has largely stalled, which would have been very hard to justify if the focus had been on output prices. One of the reasons often given for focusing on the CPI (which has come up again in discussion of nominal GDP targets) is that this data is available quickly and is not revised. Which brings me back to the beginning, because the GDP deflator numbers for the first quarter of 2013 and earlier have been significantly revised (and are smoother as a result). I have never understood this argument. We should start with why inflation is costly, and then think about how best to measure these costs. If measurements change because information gets better, policy should respond to that. If that causes problems, improve the measurement. Perhaps policy needs to obsess a bit less about this bit of data or that, and think more about the fundamentals of what it is trying to do. * I changed the text here from the original version to make the nature of the adjustment clearer. As one economic journalist put it, reallocating 0.1% of GDP between quarters makes no difference in terms of the economics, but revising away the double dip recession will play well for George Osborne politically. I think that says a lot about the quality of political debate. Another argument is that the CPI is easily understood by the non-economist. If this impresses, why not use wages rather than the CPI, as I suggested here. As wages are clearly sticky, there are good theoretical reasons to focus on this as a measure of inflation. For macroeconomists. Paul Krugman needed more coffee to get his head round the latest paper by Corsetti and Dedola. I had a similar feeling, and I have written this post to try and get my thoughts in order. So this comes with a health warning, which is that I may have failed. This post is all about the distinction between central banks and governments, but to make those distinctions clear, its helpful to consolidate their budget constraints. Initially assume that this consolidated entity can finance its deficit by either issuing bonds or printing cash. It is therefore true that this entity need never default: if no one buys its bonds, it just issues cash. However that does not mean that it will never default. Suppose, as Corsetti and Dedola do, there is a direct and simple link between cash and inflation, while issuing debt has no impact on inflation. Avoiding default by printing cash therefore creates inflation, which is costly. It may be so costly that the government/central bank entity chooses to default, rather than bear those costs. I do not think this idea is controversial, but failure to distinguish between ‘need’ and ‘choose’ can cause confusion. What may be controversial in the above is the simple quantity theory link between cash and inflation, but in fact we do not need anything so sharp. As long as printing cash is more likely to raise inflation than issuing debt, the proposition still holds. What the exact nature of the inflation link will influence, of course, is the likelihood the government will choose to default rather than create higher inflation. This choice may also be influenced by the existence of independent central banks. If governments give control over printing money and inflation to a conservative central banker in the Rogoff sense, then this could decrease the likelihood of using inflation to avoid default, and therefore makes default more likely for a given fiscal position. This may also, of course, influence fiscal policy. Whether independent central banks have that much independence is of course debatable. Now let’s add the possibility of multiple equilibria. The ‘good’ equilibria is the one where the interest paid on government debt reflects the ‘true’ probability of default i.e. it reflects the circumstances in which the consolidated government chooses to default. The ‘bad’ equilibrium is one where the rate of interest reflects a much higher probability of default. As De Grauwe has recently emphasised, because the market can in effect force default by not buying debt, this bad equilibrium is possible. However as our consolidated government/central bank can print cash, does this rule out the bad equilibrium? The answer, according to Corsetti and Dedola, is not necessarily. The reason is straightforward. Printing cash is still costly, because it raises inflation. The bad equilibrium could still exist, because to prevent it would require creating an undesirable amount of inflation, which the consolidated government will not at the end of the day do, whatever it may say it will do. However Corsetti and Dedola note that in practice, central banks are buying government debt not by printing cash, but by creating reserves. So they extend their model to include a third asset, bank reserves. In terms of the consolidated government, what are these reserves? In Corsetti and Dedola I think reserves are default free debt. They pay a risk free interest rate, but there is no chance of default, because (by some means) the central bank always promises to pay back the interest and capital with money. However, like government debt and unlike money, there is no link between the quantity of reserves and inflation. Now I find it intuitive that with this additional asset, it is now possible to remove the bad equilibrium, as the authors show. The government/central bank can simply choose to swap any normal debt that the market will not buy with reserves, which the market will buy, because reserves are default free. The government/central bank is essentially ruling out its option to default. Why does the government/central bank ever issue bonds? In the absence of the possibility of a bad equilibrium, it might prefer issuing bonds because it wants to keep the default option. I have traditionally thought about Quantitative Easing as being equivalent to swapping debt for cash. For exactly the reasons Corsetti and Dedola outline in a world without reserves, to do this permanently would raise the price level, so as a result QE is strictly temporary. But now add reserves of the Corsetti and Dedola type. QE then involves a swap between two types of debt: one default free and one not. The consolidated government/central bank is reducing its option to default on debt, in order either to remove a bad equilibria, change the term structure, increase the supply of completely safe assets, reduce its interest bill, or something else. Now what is crucial in this analysis is that issuing reserves, unlike issuing cash, has no implications for inflation. You might object that while that clearly seems realistic at the moment, this reflects the peculiar circumstances of the zero lower bound (ZLB), and in the longer term additional reserves would be inflationary because they would allow private banks to create more loans and deposits etc etc. However in this context a recent post from Paul De Grauwe and Yuemei Ji is interesting. De Grauwe and Ji, among many other things, consider the situation in a which the central bank buys government debt with reserves, and the government defaults. It is then often suggested that the central bank loses the ability to control interest rates and inflation. De Grauwe and Ji argue that this “does not hold water” for two reasons: the central bank can reduce the money stock by either raising reserve requirements, or by issuing interest bearing bonds. So would a permanently higher stock of reserves necessarily imply higher inflation once the ZLB was over? Following De Grauwe and Ji the answer is no, because either private banks can be forced to hold more reserves and not create more deposits, or the central bank could exchange reserves for some other kind of central bank asset that was still default free but which had no knock on implications for the banking sector. So to the extent that reserves are just default free debt, or can be turned into default free debt, QE does not need to be temporary even with unchanging inflation targets. Whether this is of any consequence I’m not sure, particularly as central banks do not want to make QE permanent, as recent events illustrate. Seeing reserves as default free debt may also not be terribly interesting for the UK or US right now as the perceived default risk of each country’s debt is pretty low anyway, and so the chances of a bad equilibrium emerging are equally low. 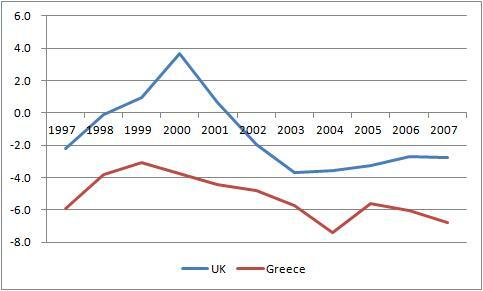 But the implications for the Eurozone are clearly much more interesting. It is both amusing and tragic to watch the advocates of fiscal austerity try and deal with the fact that the thin intellectual foundations for their approach have crumbled away, while at the same time the empirical evidence of their folly accumulates. I say thin not for dramatic effect: the economic textbooks tell us that this policy was foolish in the first place, so the austerians were always arguing something like ‘forget the accumulated wisdom of the past century, on the basis of two or three papers we know better’. Just look at the language here: ‘sceptical’, ‘somewhat greater’, ‘considerable uncertainty’, ‘no compelling evidence’. You could write a paragraph like this about virtually any economic idea. Notice also the target and how it changes: it starts off in the wrong place, by implicitly assuming that if multipliers were smaller the policy would be costless, and then at the end the target is the much stronger position that fiscal consolidation is self-defeating. Notice the language again: “do not necessarily”. The only way to make sense of this paragraph is that we are going to be stuck at the zero lower bound forever. This is more like a recitation of an article of faith than an argument. It first says reducing government debt is good for long term growth. Let’s accept that: the main arguments against austerity have never involved suggesting that long term high government debt is good for you. It’s all about when is the best time to stabilise and reduce government debt. It is the final sentence that just does not follow. Because there are long run benefits to reducing government debt, it must be the case that the sooner we start the better? No. Exercise is good for you, but you don’t start when you are down with the flu. This kind of thing is amusing sport for academics who are trying to put off getting down to serious work on a Monday morning. But of course it is tragic because the austerians, even though they have been soundly defeated on the battlefield of ideas and evidence, continue to call the shots on policy nearly everywhere. What to do about this tragedy? Just keep plugging away at the arguments I guess, although a bit of ridicule also helps convey the poverty of the austerian argument. But it is also up to others with more effective voices to point out that this emperor has no clothes. There may also be an element of Keynes famous academic scribbler in this too. (“Madmen in authority, who hear voices in the air, are distilling their frenzy from some academic scribbler of a few years back.”) There was a period - in the 1980s - when those economists studying at masters/PhD level might have been taught that the undergraduate textbooks were wrong, and that Keynesian economics was doomed. That proved to be a temporary aberration, Keynesian economics rejuvenated itself and in most departments it was restored to its rightful place at the centre of macroeconomic wisdom. But perhaps some of those now running policy did their PhDs during the 1980s, and never kept up with what happened subsequently. This is where obsession comes in. Occasionally a government fails to prevent debt exploding, and forces the monetary authority to monetise the debt, leading to hyperinflation. This is the central bankers’ nightmare. If you want to avoid this remote possibility at all costs, then you might be willing to sacrifice anything to do so, including the health of the real economy. I’m afraid this is more on Labour’s fiscal record, and the myth that this created a huge mess that current Labour leaders should apologise for. So if you have already been convinced that this is a myth, or if you will never be convinced that it is not, do not bother to read any further. However I will say something at the end about why this issue is so important, and therefore worth returning to. The key thing to remember is that this debate is all about degree. I have argued (and repeat below) that UK fiscal policy was not tight enough in the years 2003-7, certainly in hindsight, but even given what we knew at the time. As I said before, some of the best myths are based on half-truths. The issue is how serious this fault was. The myth is that this was a mistake of the highest order, which had serious consequences and which therefore requires an apology . Now the thing about myths of this kind based on half-truths is that those who perpetuate them have an ultimate fallback position. This is to switch back from myth to half-truth, and deny that they ever suggested the myth, or perhaps even to deny that the myth exists. Some of the comments on my earlier post have made this move, and Jeremy Warner in a response to my reply to his earlier post has done the same, although I have to add in a very courteous manner. I will return to this point after running through the facts. One other point to bear in mind is the distinction between wisdom at the time and in hindsight. Any argument that is specific to the fact that we had a financial crisis and a huge recession in 2008 is likely to be in hindsight. So, for example, I have argued that Labour should have aimed for a declining rather than constant debt to GDP ratio, in part because it would have given itself a bit more room for manoeuvre once the recession hit. However I would never dream of labelling a past government irresponsible and reckless for not doing this, because few macroeconomists argued this before the Great Recession. There are two types of argument put forward as to why the last Labour government’s fiscal record has been something that requires an apology. The first is that it left a serious economic mess that has been costly to clean up. Let’s call that the legacy argument. The second is that it demonstrates incompetence which, unless addressed, future Labour governments will suffer from. Take the legacy argument first. The most obvious way in which a government can mess things up for the future is by an unwarranted increase in the level of government debt. This the last Labour government clearly did not do: before the recession hit the debt to GDP ratio was slightly lower than when they took office. Of course debt rose subsequently as a result of the recession, but I talked before about why that is irrelevant. Looking at debt to GDP may be misleading for the obvious reason that it is a stock rather than a flow, and critics of Labour focus instead on the deficit. However it is not so obvious that high deficits automatically represent a legacy problem. Those same critics usually add that Labour wasted money, and if this is the case then a new government can easily correct the problem by curtailing the wasteful expenditure. Everyone gains except those the money is being wasted on, and the new government gets the credit. The argument has to be that this ‘excessive spending’, once made, is costly to reverse. But let’s leave this point to one side, and just look at the figures. Once again the data does not look promising for the critics. The current balance (which excludes investment spending) was -0.5% of GDP in 2006/7 and 2007/8, which is hardly a large number. Public sector net borrowing, which does include investment, was around 2.5% of GDP, which seems larger, but here zero is not the appropriate reference point. A sustainable deficit is one that leaves debt to GDP constant: to take some round numbers, if the debt to GDP ratio is to be sustained at 40%, and nominal GDP grows by 5%, we need net borrowing of 2% of GDP. So an actual deficit of 2.5% again does not seem that excessive. But the critics say that is misleading, because the economy in 2007 was at the high point of a huge boom. (The phrase ‘credit fuelled’ usually gets added at this point.) They say, quite rightly, that such a boom will raise taxes, and it is wrong to follow that with higher spending. So was the UK economy in 2007 at the end of a huge boom? Here is the OBR’s assessment of the output gap. The OBR’s output gap in 2007/8 was 2%, which could just count as a boom, although not huge by historical standards: the mid-70s, the end of the 1980s, and the end of the 1990s are all either larger or more sustained. 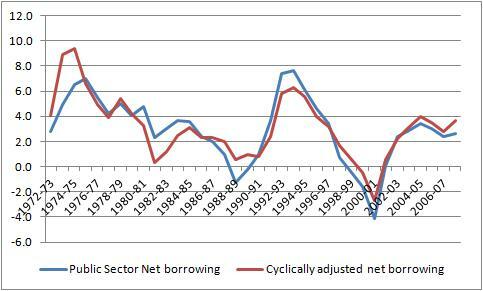 Here is the OBR’s series for net borrowing, both actual and cyclically adjusted. So what about the economic competence charge? Here I have no interest in comparing Labour and Conservative governments in general - that is a completely different kind of exercise. What I am interested in, and have written about, is what we can learn from Labour’s record about macro fiscal management. The first point is that the fiscal rules brought in by the Labour government in 1998 were progressive, both in terms of previous fiscal rules and compared to what was being done elsewhere. These included a ceiling of 40% for the debt to GDP ratio, which at the time few criticised for being too high or constant over time. Against this measure, fiscal policy was too tight in the early years of the administration. The subsequent relaxation can be seen as an attempt to correct that error, which it largely did. Debt was 36.4% of GDP in 2007/8, so correction was not complete: hence, Labour could argue, the fact that the deficit was above sustainable levels. The record shows that the Labour government did respond to fiscal outturns in the right direction. The budgets of 2006, 2007 and 2008 did involve fiscal tightening. So at face value the main mistake the government made, relative to its own rules, was to run too tight a policy in its early years, but it successfully corrected that mistake in later years. Looking at the actual record more closely, however, and you can see that there were two additional systematic mistakes that were made, which did not require hindsight and which we have learnt from. I go into detail in my paper, but they involve forecasts and cyclical correction. On forecasting, it really was a game of two halves: persistently too pessimistic, and then persistently too optimistic. On its own that is not crucial. What is important is that, towards the end of this period, Treasury forecasts were more optimistic than those of other forecasters, like the IFS or NIESR. One of the documented causes of deficit bias is overoptimistic forecasts by finance ministries, and this looks like a case in point. The second lesson is that looking at numbers ‘over the economic cycle’, as Labour’s rules did, is a problematic method of cyclical correction, for reasons I outline in my paper. Two mistakes, but neither merits a charge of incompetence. Furthermore, both these mistakes have already been dealt with by the current coalition. As I have said many times, the Conservative party deserves praise for setting up the OBR. I am pleased to have played a very minor role in helping convince them it was a good idea, and it is a great pity I could not persuade the Labour government at the same time. The coalition’s remaining fiscal rule looks at a cyclically adjusted deficit, rather than at deficits ‘over the cycle’. So unless any future Labour administration scraps the OBR, or goes back to ‘over the cycle’ rules (both extremely unlikely), then Labour has nothing left to correct! Explaining our current problems as being in significant part as a result of fiscal excess helps buttress the policy of austerity, which in a ‘zero lower bound’ recession is completely the wrong policy to pursue. Myths may also distort policy in the longer term too. I have asked many times why the current coalition embarked on their austerity programme when it was obviously such a risky thing to do. (It was risky because it either relied on the recovery being strong enough to take this deflationary shock, which we all know it was not, or it relied on unconventional and untested monetary policy being able to put things right.) Part of the answer - and I suspect it is a small part - is that some politicians looked back to a previous episode where a Conservative government ignored academic advice, and that was the monetarist experiment of Margaret Thatcher. In this post I looked in particularly at the affair of the letter from 364 economists. The myth on the political right is that events proved Mrs Thatcher right and the academics wrong. The reality is that the verdict on Mrs Thatcher’s economic policy is much more mixed, as I discuss here. If this myth played any part in emboldening the Conservative party to ignore the warnings from economists this time around, then current events show how dangerous macroeconomic myths can be. As suggested by Janan Ganesh here, for example. The Labour government, like its predecessor, to some extent used PFI to artificially reduce public borrowing. However the OBR calculate that “If all investment undertaken through PFI had been undertaken through conventional debt finance, PSND would be around 2.1 per cent of GDP higher than currently measured”. So not good, but not that big an issue in macro terms. As I note in my paper, if you look at the output gap series as currently calculated by the OECD and IMF, you get much larger figures for the size of the 2006/7 boom, and hence for the cyclically adjusted deficit. However, these numbers take a particular view of the productivity loss that emerged after the recession. (In simple terms, the UK’s measured productivity performance shows a sharp deterioration from the recession onwards, and the methodology these bodies use assumes underlying productivity does not change abruptly, so therefore underlying productivity must have been growing more slowly than anyone - including these same institutions - thought at the time in 2006/7.) The same numbers calculated in 2006/7 are much lower. Whether their current view is right or not, it is an argument entirely in hindsight. Remember the argument is all about scale, and whether deficits of this size created a serious problem for a future government that they keep having to remind us about. To give these numbers some kind of meaning, the increase in VAT from 17.5% to 20% raised taxes by about three quarters of a percent of GDP. Now you could say, quite rightly, that deficits were more difficult to deal with this time around because we hit the ZLB, but again that is an argument in hindsight, and one which is particularly inappropriate for the current government to use. The 2008 budget did not tighten in that fiscal year, which given the signs of the financial crisis already apparent showed foresight. Of course Gordon Brown was foolish from a political point of view to first talk up his prudential credentials, and then through a series of minor manoeuvres (see my paper for details) undermine that image. But that is politics, and here I focus on the numbers. Mervyn King is about to retire as Governor of the Bank of England, and there have already been assessments (e.g. here). I will not attempt to do the same, but instead just add an anecdote, an observation and a small comment. First the anecdote. Mervyn first taught in Cambridge, which in the early 1970s was a department with a large contingent of Marxist or Neo-Ricardian (i.e. anti-mainstream) staff. Mervyn gave tutorials in a third year option in economic theory, and one group he had consisted of just two students: one who would go on to achieve great things in academia and public service, and the other of more modest talents. The latter, having previously done little economics (his first year was spent reading maths), had become perhaps too impressed by the radicals, who had explained how mainstream economics was fundamentally flawed, ideologically tainted and doomed. Mervyn did not try to immediately disabuse him of these views, but instead said something like ‘OK, but have a read of these papers, such as this by Arrow on health, and see if you still think neoclassical economics has nothing to offer.’ It was a good strategy, and I’m grateful for it. Now I know nothing about this particular issue, but I have to note here that these were some of the same academic students of auction theory who helped the UK government raise £22.5 billion from the sale of the 3G spectrum - that is a few hundred pounds for each person in the country. To not consult them and follow conventional practice could have been very expensive. One set of circumstances where this academic approach will founder is when the principles on which your view is based are wrong, and events decide to teach you a lesson. The financial crisis is the obvious example: I remember being told at the Bank at the very onset of the crisis that it might take the markets a few weeks to adjust relative prices to better reflect risk. But good academics also adapt their view when the facts change (as Keynes famously noted), and King’s subsequent criticisms of too large to fail banks have been very strong and public. Which brings me to UK austerity in 2010. Before he became Governor, King made the following remark which I have always remembered: “Central banks are often accused of being obsessed with inflation. This is untrue. If they are obsessed with anything, it is with fiscal policy.” In public King encouraged the new coalition government in their austerity programme (see here, for example: HT PK). This in turn may have reflected an over optimistic view about how effective unconventional monetary policy could be in dealing with the consequences. For some that is enough to damn him, despite the clear success of the Bank in targeting inflation in the decade before the crisis. Of course we do not know exactly what was said in private advice, and in these circumstances believing politicians’ accounts can be very misleading. (For example, read Andrew Adonis on the negotiations that led to the current UK coalition government.) More important, from my own point of view, is that we do not know whether King’s view changed as evidence against austerity mounted. Many good economists made the wrong call in 2010, and have since had the courage to follow Keynes’s advice. What we do know is that in recent months King has voted for more monetary stimulus, and has been outvoted by his MPC colleagues. But I said I was not going to attempt an assessment. What I have liked is having an academic - a very good academic - running our central bank. In that, of course, I’m biased. That was the headline on a piece by Jeremy Warner, assistant editor of the Daily Telegraph. He was reacting to this post, which apparently “blogs to the effect that there was no real problem of overspending under the last government”. That is the point of the post. I was not saying that there was nothing wrong with fiscal policy under Labour, and in the paper I reference I am critical on a number of levels. What I was saying is that Labour’s performance does not justify the myth that its profligacy is responsible for most of our current economic woes. Its not a very difficult idea to grasp. But rather than grasp it, Warner prefers to suggest that I am just inconsistent, confused or worse. He also plays the arrogant academic card, which is usually a significant tell that you do not want to address the real issue. He says “what really gets my goat about the Wren-Lewis blog is the arrogant suggestion that only qualified academics are capable of speaking the truth on matters such as these.” Funny that I don’t remember writing anything like that. Indeed I was saying the complete opposite: this was not a myth that required any expertise to unravel - you just needed to look at the data. My complaint against the media was not that it was incapable of speaking the truth, but that it was unwilling to do so. Yet some journalists really do believe the myth. How can they do so, when it is a myth that is easy to unravel? Well maybe the same way they can take a piece of text, and so obviously misrepresent what it says. The same way they can have a headline which is not just untrue, but which the headline writer knows is untrue. One of the features of the incoming 1997 Labour government was that it undertook significant and progressive changes in macroeconomic policy. Not only was it right to give independence to the Bank of England , but the institutional framework they created for this was innovative and effective. As I have written recently, the fiscal framework established a year later was also clear and progressive compared to past practice and what was being done elsewhere. So could the government that gets elected in 2015 be equally bold? I think it could be. Furthermore, the suggestions I make below apply to many advanced economies. Yet why look two years ahead now, when recovery from recession is either far from complete, or for many countries has not begun? One reason is that the lags in policy making can be quite long. A new government will not have spent the year before an election working out its policies - it will have been too busy campaigning. Policies get decided much earlier. To have a chance in that decision making process, ideas need to be bounced around earlier still. On monetary policy, the new government needs to acknowledge that the recession has indicated clear problems with the inflation targeting regime. Three things need to change. First, the medium term inflation objective should be accompanied by an objective of minimising the output gap - in other words the UK should have a dual mandate like the US. Second, nominal GDP should be adopted as an intermediate target, to guide the MPC as to how best achieve these two objectives. Third, the inflation target of 2% is too low, because it increases the risk that we will soon suffer another Zero Lower Bound (ZLB) recession. In the UK the government fixes this target (which is one reason why the 1997 decision was progressive), and it should raise it. All of these changes will assist the process of recovery as well as help in the longer term. On fiscal policy, we have to distinguish between policies pre and post recovery. If the government inherits an economy where the interest rate set by the Monetary Policy Committee is still at 0.5%, then its priority should be fiscal policies that promote recovery. I agree 100% with Paul Krugman that governments around the world have needlessly confused long term issues involving debt with this short run priority: here is one of many posts I have written arguing this. Yet the incoming government should also have a fiscal strategy post recovery. This should involve both rules and institutions. Whatever fiscal rule is adopted, it should make three things clear. First, it does not apply at the ZLB. Second, it should focus on a long term objective of reducing the debt to GDP ratio. Third, deficits have to be flexible in response to shocks in the short term. Now how you square these three things is tricky, and I still have an open mind on this, but for the moment you should read this very interesting proposal from Tony Dolphin at the IPPR as to how it might be done. That proposal utilises an enhanced UK fiscal council (OBR), which is the institutional leg of the reform. Before discussing that, however, I want to say a bit more about why the policy goal should be to gradually reduce debt to GDP. I would give four main reasons. First, it allows room for fiscal policy to support monetary policy if it again hits the ZLB, without worrying about the bond markets. Second, it reduces real interest rates, which should encourage private investment (although the more open the economy the smaller this effect will be). Third, it reduces future distortionary taxation. Finally, future generations will need all the resources we can give them to help cope with their inheritance of hugely disruptive climate change. The current government should be credited with setting up the OBR, but it did so with a very restricted remit. The OBR is not allowed to crunch the numbers on alternative policies, so it cannot even produce the raw material on which others can propose advice. Perhaps this made sense to avoid throwing a new institution into the middle of a fierce political debate in 2010, but it does not make sense in the longer term. At the very least the OBR should be given the freedom to look at alternative fiscal policies, but its role could go further still, as the IPPR proposal suggests. I should confess that before 1997 I was very dubious about central bank independence. In retrospect that was because I did not have the imagination to see how that the institutional set-up could be crucial. Despite my recent criticisms, I think the MPC has done much better than elected governments would have done. However my fears were that we would get something more like the ECB, so they were not groundless. I also worried that an independent central bank might be too conservative in the Rogoff sense, and that concern has also been realised. Or equivalently, there should be a rule that directs policy in very different ways at the ZLB. In an ideal world, we would be dealing with climate change now, and perhaps - as I discussed here - using higher government debt to help pay for it. However we are not, and it does not look like this is going to change any time soon. Postscript 24/6/13: As well as leaving capacity for fiscal stimulus after a large negative demand shock, Obstfeld argues that we need low debt to leave capacity for a (partial) bail out of the financial sector. I obviously disagree with Hopi on how the Labour party should respond to the myth that their fiscal mismanagement was responsible for the UK’s current plight. If you want to get into the apology idea, then it seems reasonable that governments should only apologise for major errors rather than every particular thing they could have done better. As I have argued before, there is no comparison between Labour’s fiscal errors and the current government’s mistakes. Governments that commit errors that go against expert opinion at the time bear a particular responsibility. Few (myself included) raised objections to the constant 40% debt to GDP ratio when it was adopted in 1998. In the UK I suspect that the main short term impact of a tighter fiscal regime will be a depreciation in the exchange rate rather than lower interest rates. In the context of the last Labour government, I think that would have been helpful. Let me first recap on Woodford’s closed economy result. If real interest rates are constant, consumption smoothing ties current consumption to its steady state value, and the temporary increase in government spending has no impact on the steady state. So current consumption is unchanged, and we get an output multiplier of one. (I make the same point in a related two period setup here.) With intertemporal consumption, income effects really do not matter, so we can ignore them. At the ZLB nominal interest rates are fixed, so any increase in output will generate some inflation, reducing real interest rates. Lower real rates will increase current consumption relative to its steady state, so the multiplier exceeds one. Now why does the same logic not work in a monetary union? The key point is that nominal exchange rates are fixed, which implies that in steady state the price level has to return to its original level to keep competitiveness unchanged. So if inflation rises today, it must fall (relative to the base case) later. With fixed nominal rates, we now have lower real rates followed by a matching period of higher real rates. Working backwards from the steady state, we have a period of rising consumption, preceded by a period of falling consumption, with the impact effect being zero. So in a monetary union, consumption gradually falls, and then rises again, but is always below its initial and steady state level. Neat isn’t it! Now to relate this to the real world we would want to add lots more things, and the paper does show that with credit constrained consumers the monetary union multiplier can exceed one. But this key difference between a monetary union and a closed economy remains. And of course we are assuming here that consumers realise that in a monetary union higher inflation today will be offset by lower inflation later on, a presumption which some in periphery countries in particular might want to question. So the closed economy multiplier is lower with price level targeting. Of course price level targeting (or its equivalent) in itself does help at the ZLB, for exactly the same reason. At the ZLB it is generally assumed that inflation is below steady state, so real interest rates are high, which with inflation targeting just depresses consumption. But with price level targeting, low inflation today will be matched by high inflation and low real rates after the ZLB constraint is lifted, which supports current consumption. Just as price level targeting dampens the impact of a negative demand shock at the ZLB, so it dampens the impact of a positive demand shock like fiscal expansion at the ZLB. The government spending multiplier is still positive, but now below rather than above one. Fiscal stimulus at the ZLB is also beneficial because it reduces the extent inflation has to rise after the ZLB constraint has lifted under a price targeting type regime. So this is another example of why you cannot assess the potency of fiscal policy without taking into account the monetary policy regime. The other crucial implication for Eurozone policymakers is that in standard state of the art models countercyclical fiscal policy is effective. (I also think its desirable, but I agree effectiveness is a necessary but not sufficient condition for desirability.) But of course they all know that, don’t they! Note, however, that the multiplier of one means that human wealth has not changed anyway, because the additional output=income exactly offsets the higher tax bill. It is not exactly the same, because a monetary union involves forever fixed nominal rates: inflation falls later through competitiveness effects. In a closed economy with a price level target inflation falls, and real interest rates rise, because the central bank puts up nominal interest rates. There are two lines that monetarists might take. The first is that unconventional monetary policy, Quantitative Easing (QE), is a perfect substitute for conventional monetary policy. The second is that an appropriate monetary policy regime can, through expectations, undo the restriction imposed by the zero lower bound (ZLB). Let me take each in turn. The first argument is wrong mainly because of uncertainty. Macroeconomists know little enough, but we do know something about how conventional monetary and fiscal policy works, and we have a lot of data that can help us. We know so much less about unconventional monetary policy. What kind of model we should use is unclear, and we have very little data. The second argument would be right if we could fix inflation expectations in exactly the same way as we could, absent the ZLB, fix nominal interest rates. Would a nominal GDP target do that? Of course not. I think it would help, particularly compared to an inflation target regime, because the latter actually inhibits inflation expectations rising above that target. That is why I have recently argued that a path for nominal GDP should be adopted by central banks as an intermediate target. Would adopting such a target raise inflation expectations and speed a recovery? - I think it would. Would it raise inflation expectations by enough to negate the need for any fiscal stimulus (or, more realistically, to counteract the impact of fiscal tightening)? There is no logical reason why it should. But let us just suppose it did. Does that mean we can ignore fiscal policy? Absolutely not. What we are getting in this case is a recovery achieved by raising expected inflation above (in the UK, US and Eurozone) 2%. That is costly, because it means actual inflation must be allowed to go above 2%. The more we deflate demand through fiscal austerity, the higher inflation has to go (or the longer it has to be above 2%). So monetarists who believe in the expectations channel cannot be indifferent to fiscal policy, unless they also believe it has no effect, or that inflation above 2% is costless. (I make a similar point a little more carefully here.) If, as Paul Krugman says, fiscal policy makers are doing the wrong thing, that is a cost worth paying, but it is a cost nonetheless. This is why it is really important that central banks, like the Fed, make it publicly clear the difficulties that fiscal tightening is causing them in meeting their mandate. Either this is because they are, quite rightly, uncertain about the impact of QE, or they are aware that the more fiscal tightening there is, the more inflation will have to go above 2% to counteract its impact. The idea that to speak this truth is wrong because it might frighten the horses is silly. I have used the following analogy before. No one wants to hear a pilot tell passengers that they are no longer in control of the plane. However a better analogy in this case would be the pilot not telling the co-pilot, which would be highly dangerous. The horses that matter here are those in charge of fiscal policy, and they need frightening. Sorry Nick. I have a lot of sympathy for the point that we should not routinely exaggerate with language. The (I think just British) phrase I hate is ‘black hole’ when used to describe a worsening in the government’s accounts. The use of austerity to describe what is happening in parts of Europe and the UK right now is less obviously loaded or misleading, but I’m open to persuasion.